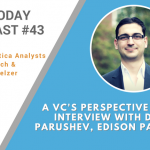 In this week’s episode of the AI Today podcast we interview Doba Parushev, Senior Associate at Edison Partners. It’s no secret that companies with an AI focus has been receiving lots of funding these days and Edison Partners is a very active VC firm in the AI industry. It’s always interesting to get VCs perspectives on the market and how new technologies are trending.